Overall, 43% of Democrats and Democratic leaners support a so-called single payer approach, but this approach is more popular among liberal Democrats (51%) than among conservative and moderate Democrats (38%). 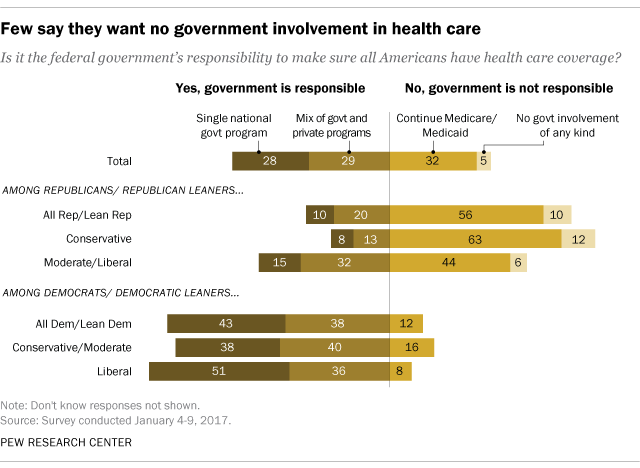 Most of those on the other side of the issue – people who say the government does not have a responsibility to ensure health coverage – say on a subsequent question that the government should continue Medicare and Medicaid (32% of the overall public), while just 5% of the public says the government should have no role in health care. 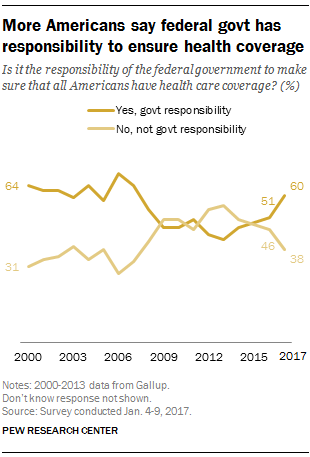 While Republicans in Congress have already taken the first steps toward repealing the ACA, Americans remain largely divided on what Congress should do with the health care law. Overall, in a Pew Research Center survey in December, 39% said it should be repealed, while an equal share (39%) said the law should be expanded. Just 15% of Americans said the law should be left as is. Although the public is divided on the future of the law, there is bipartisan support for a number of ACA provisions. Regardless of their personal views of the law, a small majority (53%) expects its major provisions will likely be eliminated. A December Kaiser Family Foundation survey shows repealing the law is not the public’s top health care priority for President-elect Donald Trump and the next Congress. Lowering the amount individuals pay for health care tops the list, with 67% of Americans saying it should be a top priority for the next administration. This is followed by lowering the cost of prescription drugs (61%) and dealing with the prescription-painkiller addiction epidemic (45%). Only 37% of the public says repealing the law should be the administration’s top priority, though views differ widely by party. Note: Survey topline is available here (PDF). Methodology can be found here.